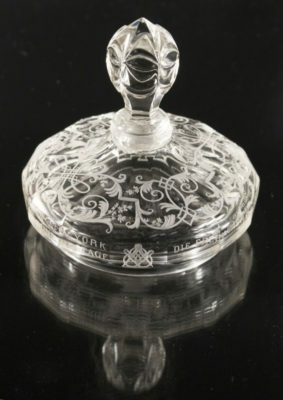 On May 3rd, 1931, the Grand Lodge of New York was presented with this lidded crystal goblet from the Grand Lodge Lessing zu den drei Ringen, from Prague, (Czechoslovakia) in celebration of the Grand Lodge of New York’s 150th Anniversary. Gross Loge Lessing zu den dre ring en in der Tscheschoslovakischen Republik. In a joint effort, the Praga Masonica Society and the Gallery of Glass in Klatovy (PASK), which is a municipal gallery housing the largest Loetz glass collection in the world, has just mounted a new exhibit, Bohemian Masonic Glass, in the town of Klatovy, in the Czech Republic. Klatovy is an old, charming market town in West Bohemia, not far from Pilsen, and in the 18th Century, it was the home of the military Lodge Sincerite. Please click here to see the video of the opening. The exhibit will be held from November 14th, 2017, until February 28, 2018. This exhibition is the result of many years of preparation, and shows objects from public and private collections across Central Europe. Jacob Sadilek, the Chairman of the Praga Masonica Society, came across a mention of the goblet given to the Grand Lodge of New York in an article from the 6th issue, page 172 of the 1931 Die Drei Ringen, the monthly periodical of the Lessing Grand Lodge. Two Brethren from Praque attended the 150th Anniversary of the Grand Lodge of New York and in the article, they mentioned that they presented the goblet at Grand Lodge. The gift was also mentioned in the Grand Lodge of New York’s official publication The Masonic Outlook in June of 1931, on page 308. In the Annual Proceedings of the GLNY for 1931, it lists that RW Felix Lenhart and RW Gustav Steinert were in attendance representing the Grand Master of Grand Lodge Lessing of Czecho-Slovakia. 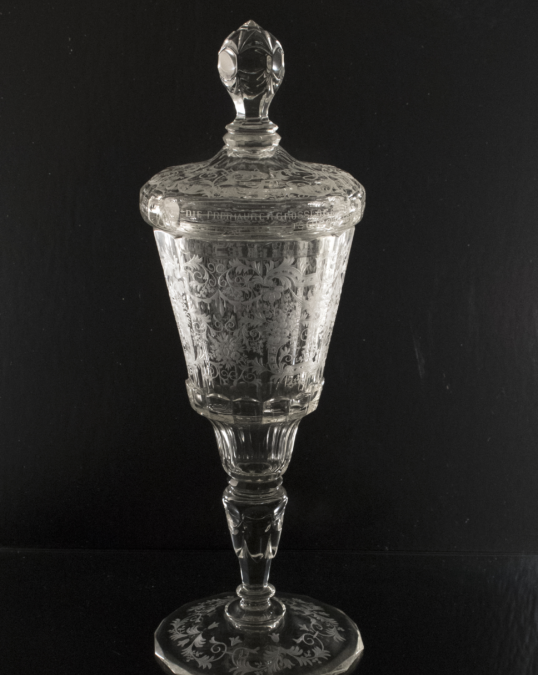 We are pleased that this goblet will be included in the catalogue to be published in honor of the exhibition and in honor of Bohemian Masonic Glass.